A moon-sized celestial object that crashed into the south pole: ETH researchers use a simulation to demonstrate why Mars consists of two notably different hemispheres. Using a computer model, the scientists have concluded that a large celestial object must have smashed into the Martian south pole in the early history of the Solar System. Their simulation shows that this impact generated so much energy that it created a magma ocean, which would have extended across what is today's southern hemisphere. The celestial body that struck Mars must have been at least one-tenth the mass of Mars to be able to unleash enough energy to create this magma ocean. The molten rock eventually solidified into the mountainous highlands that today comprise the southern hemisphere of Mars. In their simulation, the researchers assumed that the celestial body consisted to a large degree of iron, had a radius of at least 1,600 kilometres, and crashed into Mars at a speed of five kilometres per second. The event is estimated to have occurred around 4 to 15 million years after the Red Planet was formed. Mars' crust must have been very thin at that time, like the hard, caramelised surface of a crème brûlée. And, just like the popular dessert, hiding beneath the surface was a liquid interior. 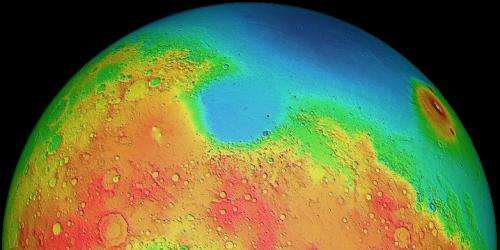 In the model, the researchers found that activity on Mars died down after around three billion years, after which time the Red Planet experienced neither volcanic activity nor a magnetic field - this is consistent with observations and measurements. This theory did not convince Leone: "Our scenarios more closely reflect a range of observations about Mars than the theory of a northern hemisphere impact," states Leone. The volcanoes on Mars are very unevenly distributed: they are common and widespread on the southern hemisphere, but are rare and limited to only a few small regions in the northern hemisphere. "Our model is an almost identical depiction of the actual distribution of volcanic identity," asserts Leone. According to the researcher, no other model has been able to portray or explain this distribution before. Their simulation was also able to reproduce the different topographies of the two hemispheres in an extremely realistic manner, says Leone. And he goes on to explain that the model - depending on the composition of the impact body chosen - is a virtually perfect representation of the size and shape of the hemispheres. One condition, however, is that the celestial body impacting Mars consist of 80 per cent iron; when the researchers simulated the impact with a celestial body made of pure silicate rock, the resulting image did not correspond to the reality of the dichotomy. Lastly, the model developed by the ETH researchers confirmed the date on which the magnetic field on Mars ceased to exist. The date calculated by the model corresponds to around 4.1 billion years ago, a figure previously proven by other scientists. The model also demonstrates why it ceased: a sharp decrease in heat flow from the core into the mantle and the crust in the first 400 million years after the impact. After a billion years, the heat flow was only one-tenth its initial value, which was too low to maintain even the volcanism. The model's calculations closely match previous calculations and mineralogical explorations. The volcanic activity is related to the heat flow, explains Leone, though the degree of volcanic activity could be varied in the simulation and influenced by the strength of the impact. This, he states, is in turn linked to the size and composition of the celestial object. In other words, the larger it is, the stronger the volcanic activity is. Nevertheless, after one billion years the volcanic vents were extinguished - regardless of the size of the impact. It has become increasingly clear to Giovanni Leone that Mars has always been an extremely hostile planet, and he considers it almost impossible that it ever had water. "Since the beginning of time, this planet was characterised by intense heat and volcanic activity, which would have evaporated any possible water and made the emergence of life highly unlikely," asserts the planet researcher. In their simulation, the researchers assumed that the object that hit Mars and created the southern regions consisted to a large degree of iron, had a radius of at least 1,600 kilometres, and crashed into Mars at a speed of five kilometres per second. This would produce a huge crater as big as Gale crater.Iron oxide is common in all regions. The fact that low, young, uncratered plains that cover most of the northern hemisphere may indicate its formation was due to a recent impact by an object that was soft and composed of strong organic acids that melted the original rough surface. This may also explain the formation of the fretted terrain, containing a complicated mix of cliffs, mesas, buttes, and straight-walled and sinuous canyons. The fretted terrain was formed at the boundary such impact by a body composed of soft strong organic acid.